In the previous lesson you learnt to develop a basic control. Your control inherited from the Control base class and emitted some HTML markup by overriding the Render() method of the base class. Though the control worked fine it lacked one important feature - support for formatting properties such as Font and ForeColor. Fortunately, the WebControl class from System.Web.UI.WebControls namespaces comes with inbuilt support for such properties. Instead of inheriting your control from the Control base class if you inherit from the WebControl control then your custom control can also avail these features. This lesson will teach you to do just that. In this article you will change the HyperLinkGroup custom control of the previous lesson. 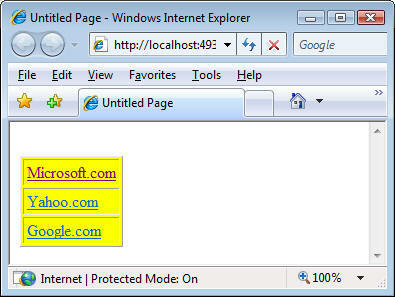 This time the HyperLinkGroup control inherits from WebControl base class. 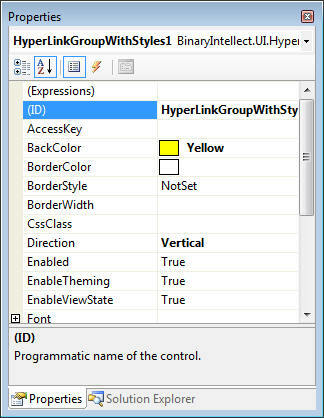 Notice that the constructor of HyperLinkGroupWithStyles calls the base class constructors by passing the base HTML tag. The base HTML tag is specified via HtmlTextWriterTag enumeration. All the style attributes you specify later are added to this base tag. The AddAttributesToRender() method receives a parameter of type HtmlTextWriter using which you can add style attributes to the base tag. Inside you first call AddAttributesToRender() method on the base class so that any implementation written in the base class gets executed. Then you add Border and CellPadding attributes using AddAttribute() method. This way your base HTML <table> tag will have Border attribute set to 1 and CellPadding attribute set to 3. Recollect that in the preceding lesson you used methods such as WriteBeginTag() and WriteEndTag(). This time you use RenderBeginTag(), AddAttribute() and RenderEndTag() methods instead. The RenderBeginTag() method allows you to specify tag to be rendered using HtmlTextWriterTag enumeration. Note the use of AddAttribute() method. This method emits an attribute as specified by HtmlTextWriterAttribute enumeration to the following tag emitted by RenderBeginTag() method. The RenderEndTag() simply closes the nearest tag opened using RenderBeginTag() method. This completes the control. You can now use it on your web forms as illustrated in the previous lesson. When you drag and drop an instance of HyperLinkGroupWithStyles control on the web form it shows various additional properties in the properties window. These properties are supplied by the WebControl base class. The following figure shows a sample run of the web form that contains an instance of HyperLinkGroupWithStyles control.